Have many of you tried IR photography with a Fuji X20? I recently bought a IR filter, IR850mn just to try some different effects. Unfortunately even in bright sunlight the resulting picture is almost totally dark! I set the ISO to 5000 and speed at 1/15th. Am I doing something wrong or is it just not possible with this camera? No you're not doing anything wrong except expecting too much. The IR filter you have fitted will block all colour/visible light and allow only Infrared light to pass. Your camera is already fitted with an IR blocking filter which keeps most IR light out. So now you are dependent on just a small amount of IR light alone to make your exposures. You can do it ( I did for a few years) but you must use a tripod and remote release or timer release. Your IR filter is for BW only. 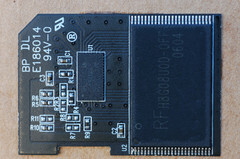 An IR filter such as Hoya R72 (720nm) will allow some visible (colour) light through and give shorter exposure from which you can still produce BW IR but it will still require something like 1.5 secs f5.6 ISO 400 on a tripod. I did this and was satisfied except for carrying around a tripod as I became less able and for foliage moving in the wind. I bought an unused Fuji XE1 for £150 and spent another £150 sending it to USA for conversion to 590nm IR. I can shoot this handheld at normal speeds because the IR blocking filter is removed and a partial colour/visible light blocking filter is fitted to block some of the colour light. The key is to allow through all IR light. I can also fit a lens IR filters of 650nm, 720nm (I mostly use) or 830/850nm BW and still shoot handheld. Only with the BW IR filters added do I need to increase exposure by about 1.5 stops, so still easily handheld. Here's a link to one of my IR galleries on Google pics. A few were taken with the basic 650nm conversion (the distinctly gold/blue ones). The vast majority including the BW, were taken with a Hoya R72 (720nm) lens filter added and all are handheld. You'll notice many identical except some are colour and some BW - that's all down to the processing. Apart from the deer/swan shots (55-200mm) they were taken with the Fuji 14mm f2.8 - one of the finest IR lenses to be found. It is rewarding so get your tripod out and try to keep the ISO down because noise shows more in IR, especially with an 850nm filter. Many thanks for the information, it's very helpful. I do have an old tripod and I'll see what I can do. I do like your photos, very atmospheric, where is the cemetery, Highgate, Kensal Green? They are West Norwood and Nunhead, two of the "Magnificent Seven cemeteries" which includes Highgate and Kensal green cemeteries. Overgrown cemeteries are great for IR. The dinosaur ones are Crystal Palace park and the others are various parks around SW London. Thanks, I used to live near Kensal Green, more than 50 years ago before I moved to Somerset. I used IR filters on the lens for a while having used Kodak IR film with 35mm cameras some years ago. But I now use a converted XE1 for IR photography too. I bought the used camera for £200 I think but paid rather more than Vic to have it converted in the UK (about £300 as I recall). I enjoy the results - although have yet to achieve the high standards of the lovely images in Vic's gallery. 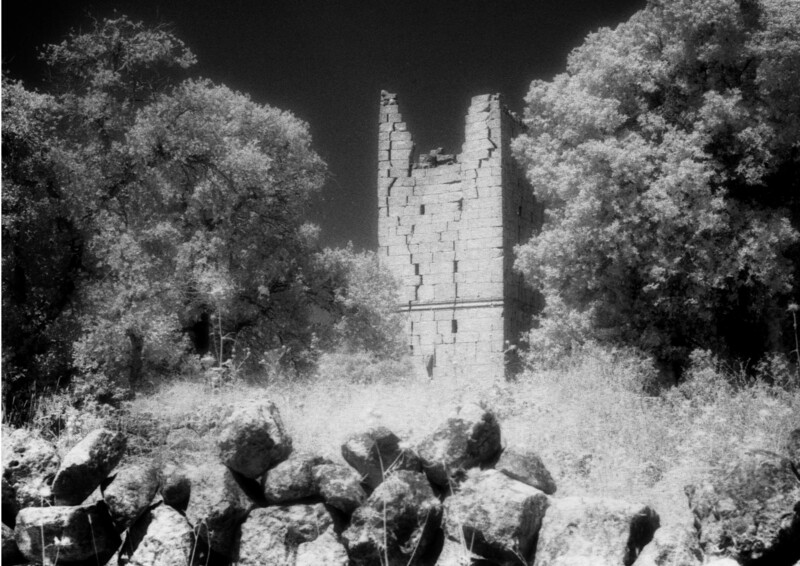 This crumbling tower was in the dead cities of Syria probably taken with a Nikon on IR film and scanned. If only I'd had my converted XE1 for that trip. Thanks Chris. I do a lot in post and found my way simply by experimenting. Here's a few from yesterday. You can use the radial filter in LR or Nik suite Vivezza to remove/lessen the effects of hotspots which occur mostly at smaller apertures. Of course, with the 14mm you can shoot at f4 and get good DoF. Mine is usually set f8 with the inf mark on the f8 to give me Dof from a few feet to inf. Before I got the 14mm I was using a MF Minolta 24mm the same way - old lenses have distance and DoF scales, unfortunately not many affordable film lenses are WA enough. The Fuji 23mm f1.4 35mm f1.4 are good and the 90 and 55-200. The 16-50, & 18-55 are poor. The expensive Fuji 16-55mm f2.8 is quite good but at f8 and bright sun it sometimes requires work on a faint-ish hotspot. It's just so easy to fit the 14mm and set it and leave as above, especially on the diminutive but very capable XE1 knowing the DoF will cover everything whether shooting close or distant. I experimented with the above setup and my Fuji flash with an 890nm filter covering the front so no visible light was emitted when I shot in my garden at night - I got more flash distance than shooting conventionally at night - even room light has IR. I now have a real puzzle! When I tried the IR filter, as mentioned in my initial post, all I got was a slight red glow and nothing more. Veejaycee explained where I'd gone wrong and thank you. But now, when I switch the camera on I briefly see the same red glow! It doesn't seem to appear in photos but I tried covering the lens and firing the shutter the resulting photo is just the red glow, when it ought to be black. It's almost as if the image has burnt itself onto the sensor. Is this possible? I don't have an X20 but I know it has a small sensor. I suggest you shoot with aperture wide open to begin with and only close to f4 anyway as that will still give plenty of DoF. Check the menus for items such as "preview exposure/WB in manual" or "preview picture effect". If you have either of these options, turn them off. I don't know the IR suitability of the lens on the X20. Some lenses will exhibit a hotspot and there's nothing you can do about it on the X20 - it may be responsible for the glow you see if it's only central. Thanks, I'll look for the other things you suggest.